Chinese astronomers watching the sky on July 4, 1054, noted the appearance of a new or "guest" star just above the southern horn of Taurus. It was described as yellow in color by Yang Wei-te, the court astronomer (astrologer) to the Sung emperor. Unbeknownst to the Chinese, what they were witnessing was one of the most violent events in stellar evolution; a supernova explosion occurring at a distance of approximately 6,300 light-years from Earth. At its peak, the supernova had a visual magnitude of about -6, and could be seen during the day for 23 days and was visible to the naked eye for 653 days at night. It was the brightest object in the sky next to the Moon for a few months, and is the best known supernova in the history of astronomy. 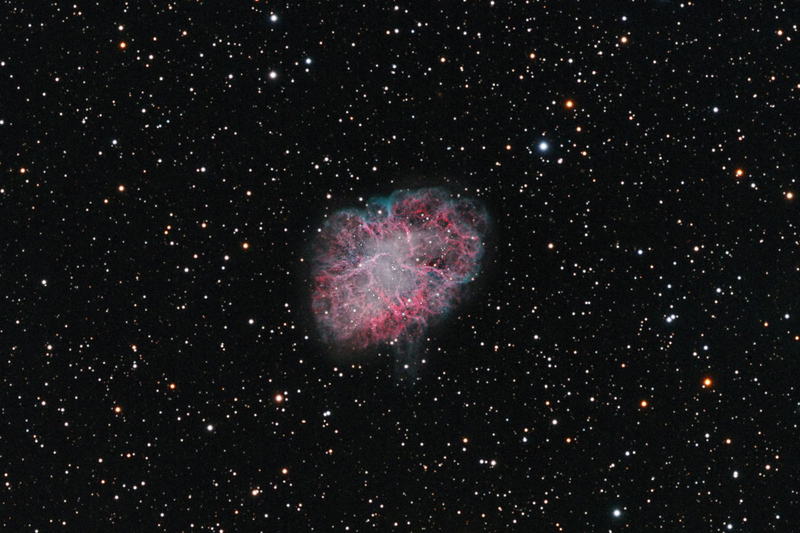 The aftermath of this cataclysmic event gave birth to the Crab Nebula we know today. The name Crab Nebula is attributed to William Parsons, 3rd Earl of Rosse, who observed the object in 1840 using a 36-inch telescope at his Birr Castle observatory in Ireland and produced a drawing that looked somewhat like a crab. The Crab Nebula currently spans about 10 light-years across and is continuously expanding, with the ejected material moving outward at more than 3 million mph. The bright filaments or threads of the nebula contain somewhere between 3 and 7 solar masses of material and are around 15,000 C (27,000 F) in temperature. At the center of the nebula lies the birth-child of the supernova event, a mysterious entity known as a pulsar. The extreme conditions found there create deep gravitational potentials, densities exceeding nuclear proportions, and extreme magnetic fields of up to one million billion gauss. The pulsar is thought to be only 18 miles in diameter, have a mass of at least 1.5 solar masses, and generate powerful magnetic fields that concentrate its radiation emissions into narrow beams that broadcast across space like a lighthouse beacon. Spinning on its axis at 30 times per second, it is slowly decelerating by 38 nanoseconds per day because the pulsar wind carries away a great deal of energy in the process. This image is a collaborative effort between Howard Hedlund of Astro-Physics, Inc. and Dave Jurasevich, with a total exposure time of 20 hours. Processed as a L(Ha + OIII)RGB image including RGB data and an L layer composed of H alpha with OIII layer masked over the H alpha and blended to bring out the bluish halo around the Crab and the little “tail” at its bottom.